A community service form is utilized to verify all the community service works which are performed for a nonprofit organization. By submitting this form to the concerned authority, an organization certifies that all the information and facts contained in the documents of the organization are accurate and true. All the data submitted through the community service form will be checked and verified with the nonprofit organization. There are several kinds of the Service Forms available out there. 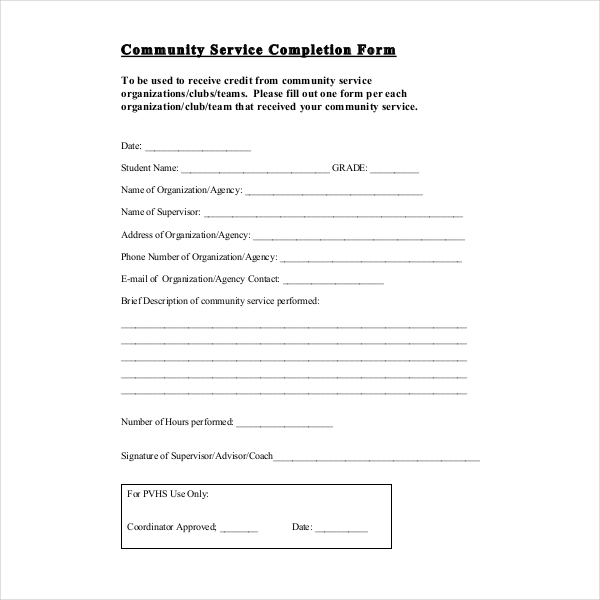 Community service completion form is utilized to receive credit from community service clubs or organizations or teams. The community service provider has to fill out one form per each club/ team/organization which accepted the service of the particular community. The form contains certain fields such as the name of the student, the name of the organization, name of the supervisor, address of the organization, brief description of several services performed by the specific community. 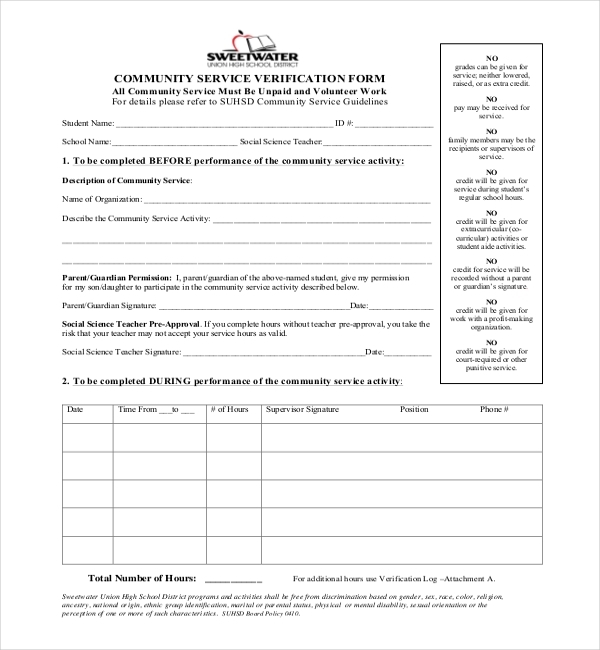 A student has to fill up the community service verification form in order to continue to participate in the activities of the particular community service. The student has to provide some personal information such as his/ her name, Id, the name of his/ her school, the name of the teacher of social science. After participating in the activities done by the particular community service center, the student has to describe all those activities in the form. The parents of the participant also need to sign the form to show their acceptance of the activities done by their child. Anyone who is over eighteen years old can apply for a community service card. In order to get a membership of a community service center, the willing person has to fill up an application form. 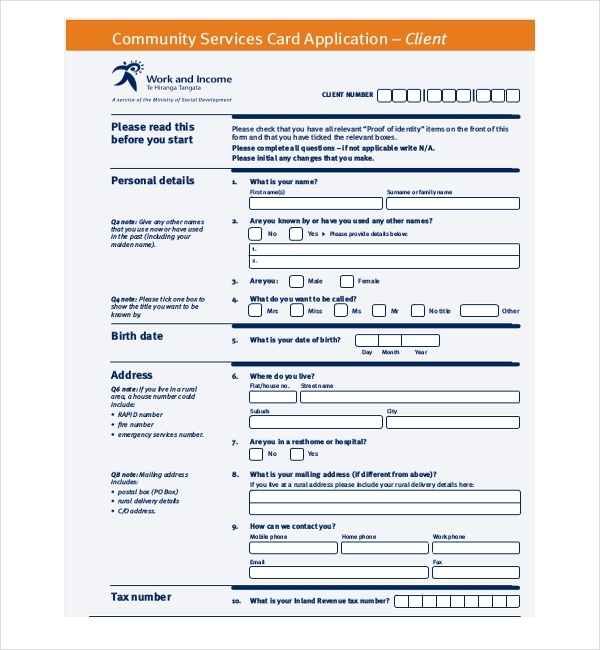 This application form is known to be the community services card application form. The person seeking for the membership of the community service has to verify certain facts such as he / she is over 18 years old, he/ she has a low to middle income, details about his family members and children and so on. A student or the participant willing to take part in the activities done by a community center, has to fill up the community service project and hours form in order to verify the fact that he/she has taken part in all the activities properly. The participant has to mention that he/ she has completed all the required projects within the given hours. The supervisor has to verify the reality of all the statements of the participant by signing the form. 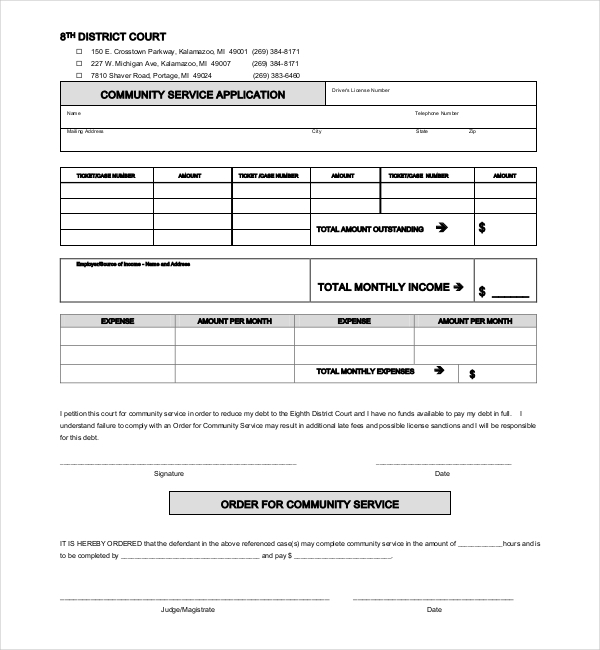 The purpose of the court community service form is to verify that all the community service work is done for a nonprofit agency as mentioned on the community service instructions. By submitting the form to the court, the community service center confirms that all the data contained is accurate and true. All the information provided via the form will be strictly verified. The participant has to fill out some basic information such as the name of the defendant, the birth details, the number of the specific case, the name of the supervisor and so on. These kinds of community volunteer forms are needed to implement the activities of the particular community center. The form also helps to ensure the continued success of the community service center. The form also contains all the details of the active volunteers of the community center. The participants need to fill out some basic personal information such as the name, email address, cell phone number, and home phone number and so on. This volunteer community service form is actually an application form. 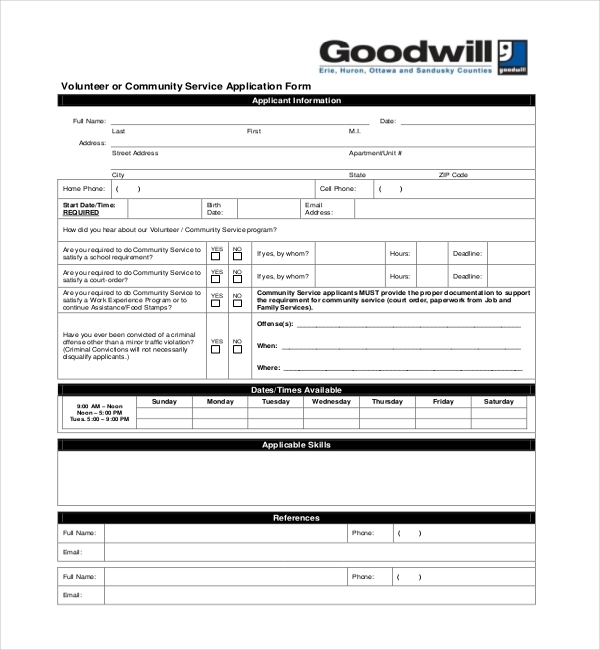 This form is used by an individual who is willing to take part in the activities of a community service center. The willing person has to provide the proper reasons behind his/her wish to be a part of the activities done by the community service center. This community service form is used by West Orange high school. This form explains all the guidelines of the activities of the community service done by the high school. This form contains some basic sections such as the personal information of the students, the date of the service, the duration of the service, the name of the organization and so on. 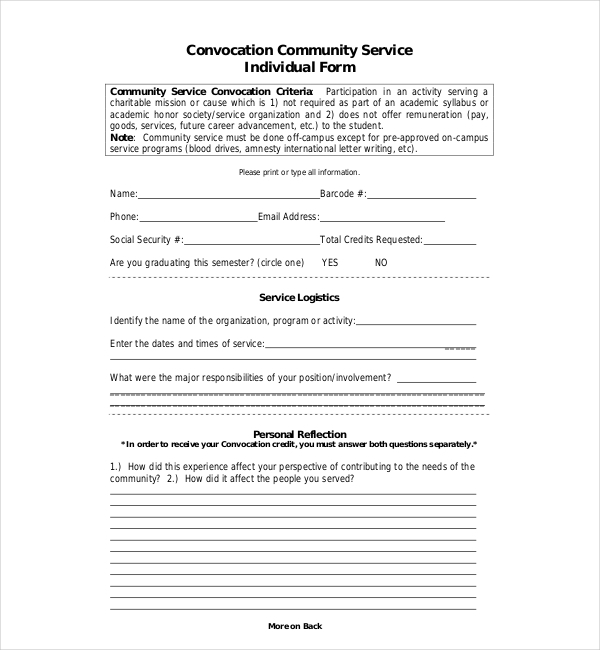 A convocation community service individual form is used as an application form. Taking part in a convocation community service explains some criteria such as taking part in such activities is a charitable mission. This mission does not require being the part of any academic session. These activities do not offer any kind of remuneration. 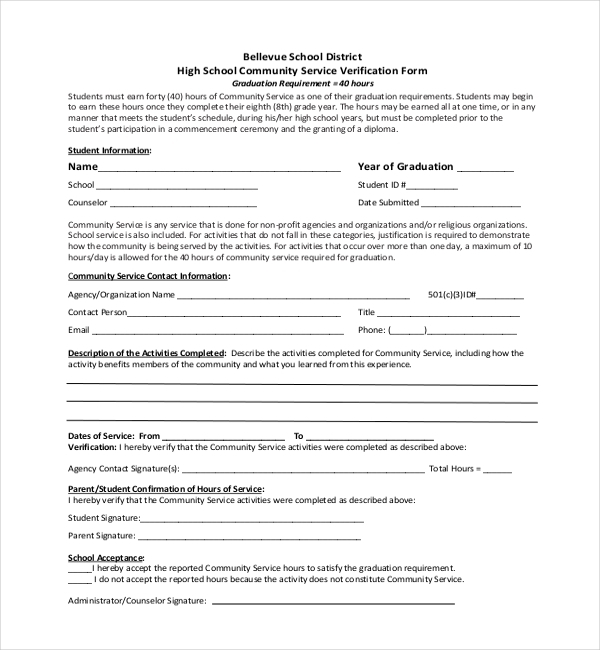 Several high schools use these kinds of community service forms to verify the graduation requirements. All the students need to take part in the entire program of the community service programs. These kind of forms contain certain basic information such as the name of the students, the year of graduation, the student ID, the name of the school, the name of the counselor and son. The students who qualify their Federal Work Study must complete a community service over the course of the academic year. However, students can also choose to fulfill their study via community service by attending the CSWS program. 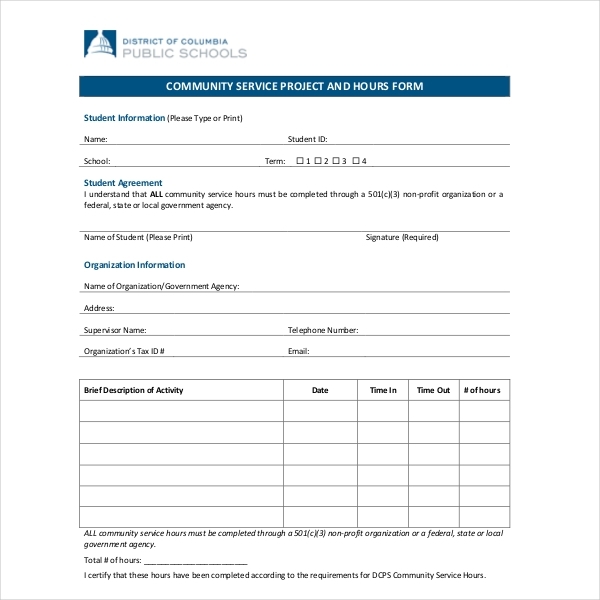 Students have to fill out the community service work study completion form in order to enroll in the CSWS program. The term community service refers to any service which is done for any non-profit organizations, agencies, and religious organization with no monetary agenda. Educational institutions are also included. What are The Legal Norms Applied for a Community Service Center? Why Do People Seek to Fill Out The Community Service Form? 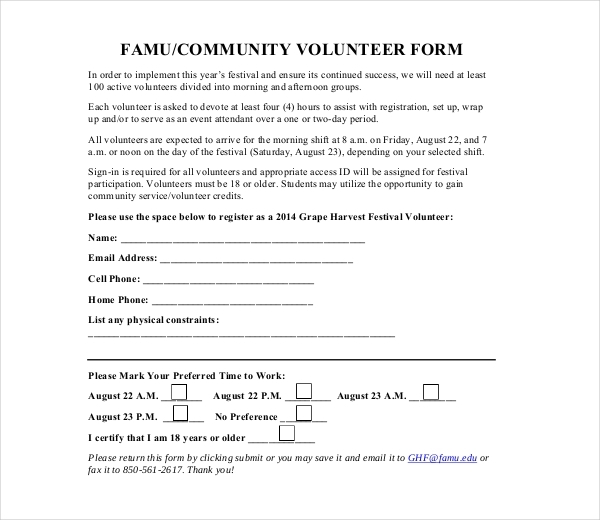 Basically, individuals seek to fill out these community service forms in order to take part in the activities as a volunteer. The act of volunteering adds both to the society and the volunteers themselves. The volunteers help deliver products, opportunities, and services by providing their resources and time to several organizations. The benefits of volunteering are not at all restricted to financial achievements to the economy. As per surveys record, the job of volunteering enriches social ambiance, builds up communities and provides the volunteers with many facilities. The task of volunteering can also enhance the social inclusion, physiological and physical well-being and the volunteers might get some career opportunities while working for the program of the community service. Along with providing vital community services, the volunteers, and the community service organizations also contribute to several government community consultations which inform program and policy development. Where Can One Get These Community Service Forms? If you are still finding it difficult to download a well-structured community service form, we can help you by providing one. These forms are available in both PDF and word documents. You can even exit and modify the forms as per your requirements. Get these forms in both high and lower compatibility versions without any errors. They have been made intricately to suit your needs and have a high success rate as well.